I am fat. I could be polite and politically correct by saying I am overweight or even obese. But the plain truth is that I have too much fat -- so much so that I am fat, or at least a good proportion of me is made from fat. Don't worry. I've had decades to get used to the truth. I've been on eternal diets, taken "miracle pills" that didn't work and adjusted to the way people treat me because of my size. Like many fat people, I was a fat kid. In grade school I was in a large class of about 50 children. Besides myself, there were two other fat kids in my class. The three of us suffered the humiliation of being ridiculed for our size. We never played games in the schoolyard with the other kids and we were almost never invited to parties or dances. It was like we had a contageous disease and no one wanted to get too close to us. Childhood obesity is now much more prevalent. According to the CDC, the average number of obese children has risen three-fold since my elementary school days. Today, in 2014, my class of 50 children could be expected to count 9 obese kids (an increase from 6% to over 18%). Heck, we could have started a gang back in my day! Being big is now quite the norm and many of the social stigmas have diminished. But even as the social stigmas of being obese are lessening, the negative impact on health lingers into adulthood. 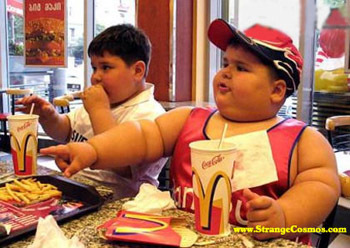 There is a common belief that eating fast food, like at McDonald's or Taco Bell, is what causes kids to become obese. Photos like this one [right] perpetuate the myth that convenience restaurants are feeding us unhealthy food which is making us gain weight. The myth seems to be easily validated by a visit to McDonalds's or Burger King and noticing the weight of their customers. But is there more to the story? As reported in ScienceDaily, a recent study found that fast food is not the major cause of rising childhood obesity rates. The link between eating at fast food restaurants and childhood obesity appears to be a byproduct of a much larger problem: poor all-day-long dietary habits that originate in children's homes. The study, titled "The association of fast food consumption with poor dietary outcomes and obesity among children: is it the fast food or the remainder of diet?," was produced by researchers at The University of North Carolina at Chapel Hill's Gillings School of Global Public Health and published in the latest issue of The American Journal of Clinical Nutrition. The study's researchers found that children's consumption of fast food is only a small part of a much more pervasive dietary pattern that is fostered at an early age by children's parents and caregivers. The dietary pattern includes few fruits and vegetables, relying instead on high amounts of processed food and sugar-sweetened beverages. These food choices also are reinforced in the meals students are offered at school. "This is really what is driving children's obesity. Eating fast foods is just one behavior that results from those bad habits. Just because children who eat more fast food are the most likely to become obese does not prove that calories from fast foods bear the brunt of the blame." The study examined data acquired through the National Health and Nutrition Examination Survey (NHANES) between 2007 and 2010. 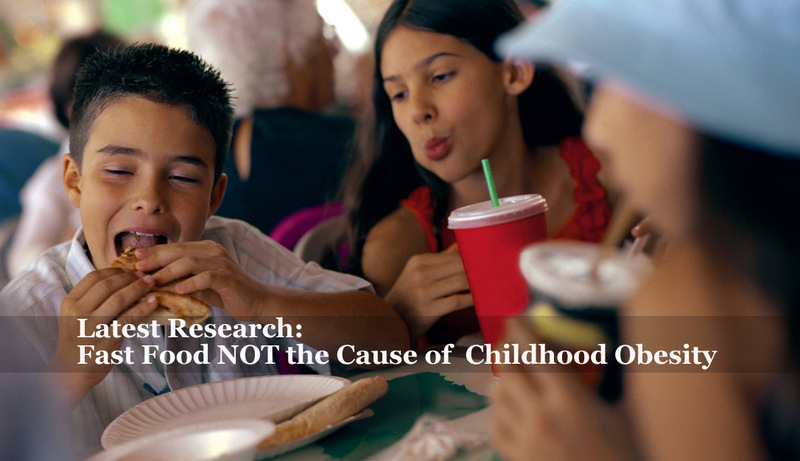 Dietary intake, including whether foods and beverages were obtained in fast-food establishments or elsewhere, was evaluated in 4,466 children who were 2 years to 18 years of age. They were further categorized as being nonconsumers of fast food (50 percent of the children), low consumers (less than or equal to 30 percent of calories from fast foods; 40 percent of the children), or high consumers (more than30 percent of calories from fast foods; 10 percent of the children). The researchers then determined which factors were most related to dietary adequacy and risk for obesity. "The study presented strong evidence that the children's diet beyond fast food consumption is more strongly linked to poor nutrition and obesity. While reducing fast-food intake is important, the rest of a child's diet should not be overlooked." Popkin said he is certainly no fan of fast-food consumption, but actually knowing where the problem originates is important if we are to invest in solutions that foster healthier habits, including reducing the consumption of sugary drinks and emphasizing more fresh vegetables and fruit. "Children who rely on fast foods may tend to have parents who do not have the means, desire or time to purchase or prepare healthy foods at home. This is really what is driving children's obesity and what needs to be addressed in any solution." Most of the global population is hungry. The obesity epidemic is endemic to developed countries -- many without the benefit of fast food restaurants. Top on the list are USA, Brazil, China, Japan, Australia and the UK. Childhood obesity happens in all types of climates and cultures. The fact that there is such a diversity of cultures involved points to some common denominator whereby the caloric intake of children is greater than the caloric energy expenditure. This has led scientists to look for some thread associated with the changing lifestyles of developing, industrial based economies. Psychologists weigh in on the subject by explaining how developed economies usually require more household income, meaning that both parents usually must work to support the family. With less time available to prepare and cook healthy meals, children are more often encouraged to feed themselves with "instant" foods which are usually higher in fat, sugar and salt content. "When children return from school they often find that they are left to forage for food on their own. Instead of some rice and vegetables, dinner usually consists of something from the freezer to the microwave. Frozen meals compete with each other with flavor enhancers like sugar and salt. Most are high in both calories and fat. Most all are deficient in vegetables. Children develop a taste for sweetness and this taste, once acquired, lasts a lifetime. Fast foods merely reflect the kind of tastes that are learned at home." In my day, the closest we got to fast food at school was fish sticks. Usually we had mashed potatoes and string beans as a compliment to some kind of meat or poultry. It was the same kind of food that Mom prepared for our dinner, only smaller portions. Today that has changed. 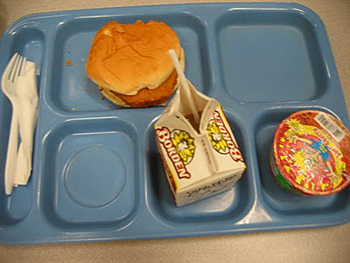 [right] Chicken patty, bun, chocolate milk and "Sour Chery Natural Cooler" -- a healthy lunch according to USDA school lunch regulations. Where are the veggies? According to Susan Terwilliger, clinical associate professor in the Decker School of Nursing at Binghamton University, who studied the problem, two of the biggest influences on children -- parents and schools -- may unintentionally contribute to childhood obesity . "As a pediatric nurse practitioner I've taken care of children and their families for about 30 years, and I saw this huge increase [in childhood obesity] from 5 to 30 percent over about a 10-year period when I was in the school-based health centers." Terwilliger studied third-graders in four schools in Binghamton, NY. She found that 70 percent of the children drank between two and five sweetened beverages a day; 85 percent watched between two and five hours of television a day; and 42 percent ate two or more fast-food meals per week. Terwilliger also found that parents unintentionally contributed to the obesity epidemic. Children who are told by parents to avoid water fountains because of germs may instead drink sweetened juices with hundreds of calories. Fear of potential danger can prompt parents to restrict children's play space to a backyard or inside the house, thus limiting the potential exercise and caloric expenditure. Further, schools sometimes trade gym class or recess for academics as they try to raise test scores. "Eating fast food on the way to soccer may seem like a tradeoff healthwise... One of the reasons fast food fits into a hectic schedule is that processed food, with its high fat content, literally slips down easily. And the quicker and easier it is to eat, the more you may consume. There is a lot of data that say today's kids won't live as long as their parents." "I now have 13-year-olds with type 2 diabetes. Heart attack is the number one cause of death and stroke the number three cause, and diabetes and hypertension, both caused by obesity, contribute to both." I can relate to this. I now have diabetes and along with it the complications from poor circulation and bad eye-sight. Remember I told you about two other fat kids in my elementary school class? Well both had unhealthy lives as adults and they are both now deceased from complications resulting from their childhood obesity. It's a big problem (no pun intended). Restricting fast foods is not the answer. The solution is in the home and school where good nutrition and exercise need to be part of the curriculum. It does no good blaming restaurants. Good article but I disagree with the idea that fast food restaurants are not to blame. They target kids in their advertisements and often offer free toys with "Happy Meals" and such. This forces the parent to give in the their children who watch the ads on TV. They should be more responsible even though it may cut into their corporate profits. Burger Death: Don't Eat One! A Steady, High-fat Diet Is Bad, But The News Gets Worse. So much for the adage, 'All things in moderation.' Researchers at the University of Calgary have found that people who consume a single, high-fat meal are more prone to suffer the physical consequences of stress than those who eat a low-fat meal. Published in the Journal of Nutrition, the recent study looked at the stress responses of two groups of students: one group consumed a fast-food breakfast from McDonald's, the other ate dry cereal with skim milk, cereal bars and non-fat yogurt. "What's really shocking is that this is just one meal," says Dr Tavis Campbell, a specialist in behavioural medicine and senior author of the study. "It's been well documented that a high-fat diet leads to artherosclerosis and high blood pressure, and that exaggerated and prolonged cardiovascular responses to stress are associated with high blood pressure in the future. So when we learn that even a single, high-fat meal can make you more reactive to stress, it's cause for concern because it suggests a new and damaging way that a high-fat diet affects cardiovascular function." In the study, 30 healthy young adults fasted the night before, then consumed either a high- or low-fat breakfast. Both meals had the same number of calories and the low-fat breakfast included supplements to balance it for sodium and potassium. Two hours later the two groups were subjected to standard physical and mental stress tests while having their cardiovascular responses measured. They performed a mathematical test designed to be stressful, completed a public speaking exercise about something emotionally provocative, held an arm in ice water, and had a blood pressure cuff inflated around an arm, which gradually causes a dull ache. "Regardless of the task, we recorded greater reactivity among those who consumed the high-fat meal in several cardiovascular measures we recorded, including blood pressure, heart rate and the resistance of blood vessels," says Fabijana Jakulj, a U of C student who used the study as the basis for her honors thesis. Campbell cautions that despite the grim message that even one high-fat meal is unhealthy, more research is needed to fully understand how the mechanisms work. "Telling people to never eat something is probably not a good way to promote a better diet," he says. "At the same time we do have an epidemic of obesity in North America and it's important that people try to make informed choices." Other students affiliated with the University of Calgary who took part in the study include Kristin Zernicke, Laura E. van Wielingen and Brenda L. Key. Simon L. Bacon, Concordia University in Montreal, and Sheila G. West, Pennsylvania State University, were also co-authors. 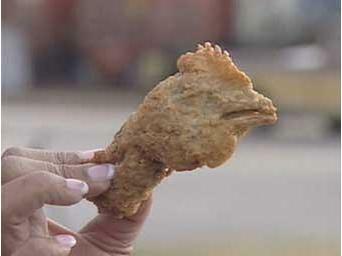 "The ingredients listed in the flyer suggest a lot of thought goes into a nugget, that and a lot of corn. Of the thirty-eight ingredients it takes to make a McNugget, I counted thirteen that can be derived from corn: the corn-fed chicken itself; modified cornstarch (to bind the pulverized chicken meat); mono-, tri-, and diglycerides (emulsifiers, which keep the fats and water from separating); dextrose; lecithin (another emulsifier); chicken broth (to restore some of the flavor that processing leeches out); yellow corn flour and more modified cornstarch (for the batter); cornstarch (a filler); vegetable shortening; partially hydrogenated corn oil; and citric acid as a preservative. A couple of other plants take part in the nugget: There's some wheat in the batter, and on any given day the hydrogenated oil could come from soybeans, canola, or cotton rather than corn, depending on the market price and availability."